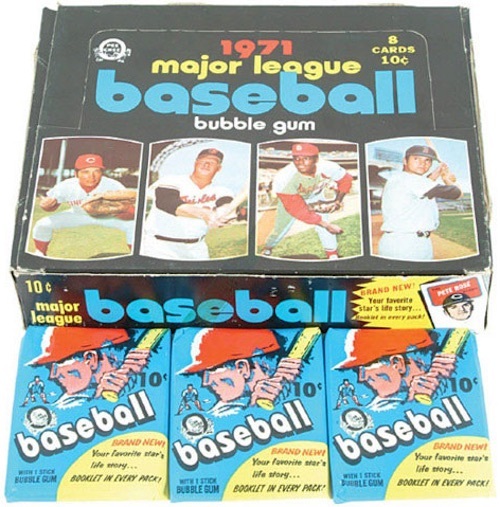 1971 Topps Baseball is wildly popular based on the player selection, key rookie cards, and the challenge that the sensitive design presents. Also an appealing option for set builders, the release draws a wide range of collectors. 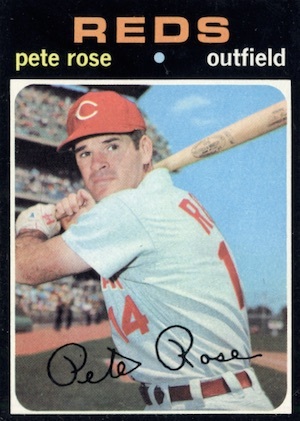 The 1971 Topps Baseball card set has two major distinctions that set is apart from previous releases. First, the checklist size once again rewrote the record books, delivering a total of 752 cards. Also, the set is widely considered to be the most condition-sensitive of all-time. Shop for 1971 Topps Baseball cards on eBay. 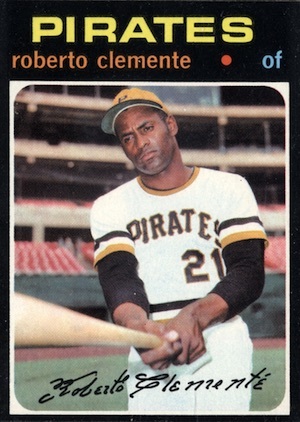 Although the design represents a vast improvement over the previous year, one major point of contention for collectors is the black borders in 1971 Topps Baseball. This makes the cards extremely susceptible to damage, particularly in the form of edge wear, chipping and corner fraying. These condition traits make the set set one of the most difficult to assemble in high-grade condition. Singles that do receive high marks can command huge sums as vintage collectors aggressively compete for these rare gems. 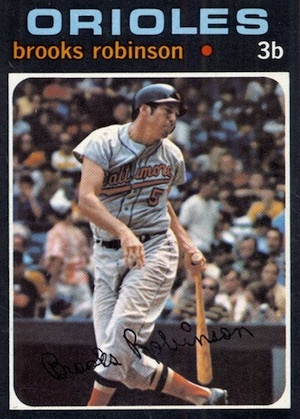 In addition to the notorious black border, the front of the cards display the player's team nickname in large letters along the top of the card. 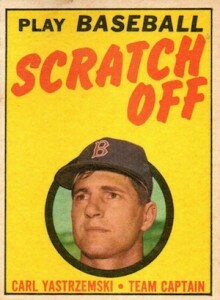 The player's name and fielding position are found below that in lower-case lettering and are separated by a dot. The cards also display a facsimile signature on the player photo. 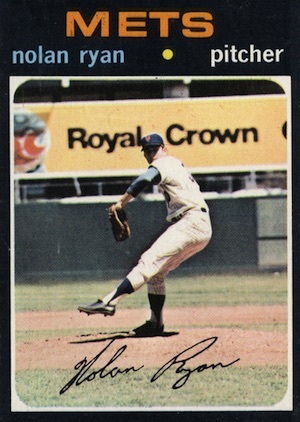 The action photography on the 1971 Topps Baseball cards was met with delight by collectors, who after decades of posed player portraits, welcomed the change of pace. In-game action photographs were used throughout the set's base card checklist. Up to this point, these types of photos had been only used for the World Series and Playoff Highlights subsets. 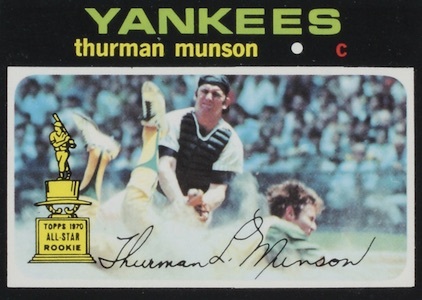 Perhaps the most iconic option in the release, Thurman Munson's All-Star Rookie card showcases a close play at home plate with Munson trying to tag out an Oakland Athletics base runner. 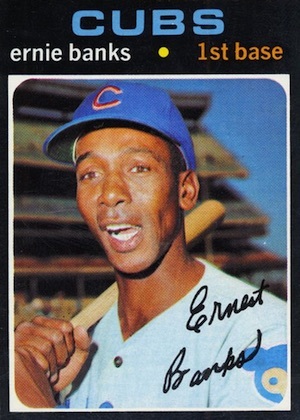 A first for Topps, the backs of the 1971 Topps Baseball cards also feature a photo of each player. Unfortunately, this came at the expense of season-by-season statistics for each player, as there was simply not enough space to include both. The lack of in-depth statistics was unpopular with collectors but the look is distinct and the green back enhances that. 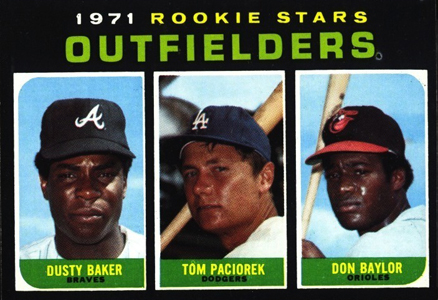 Largely anchored by Hall of Fame names, 1971 Topps also has quite a few notable rookies. 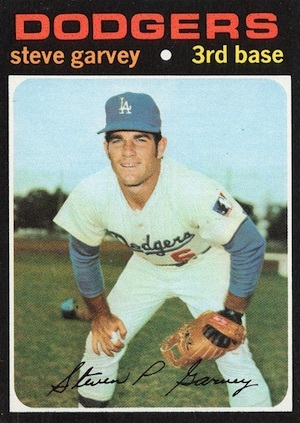 While there are none that fall in the superstar category, Bert Blyleven, Don Baylor and Dusty Baker, Steve Garvey, Dave Concepcion, George Foster and Ken Singleton are some of the key rookie cards in the product. 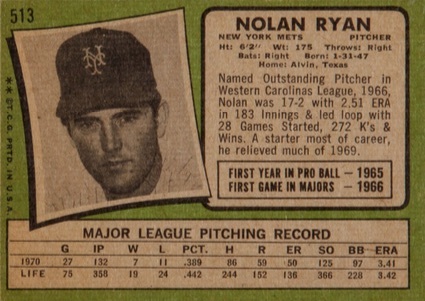 Additionally, three recurring subsets add to 1971 Baseball, including League Leaders (#61-72), Playoff Highlights (#195-202) and World Series Highlights (#327-332). Collectors can also find checklists, team cards and multi-player Rookie Stars. 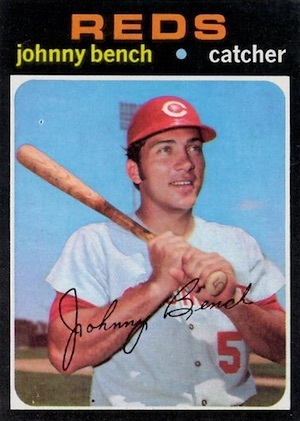 As is the case with most vintage Topps sets, the 1971 Topps Baseball high-number cards are slightly more difficult to locate and are generally more expensive. In addition to the seventh series of cards (#644-752), the sixth series (#524-643) also appears to have been printed in smaller quantities than the previous five. It is widely accepted amongst collectors that 44 cards in the final series were double printed. As a result, the remaining 66 cards from the series are considered to be short prints in comparison. 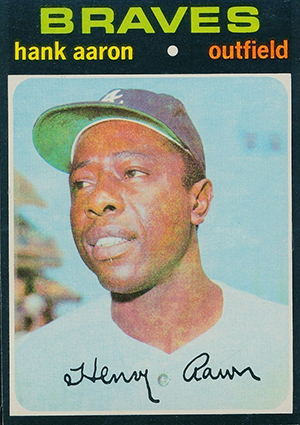 Only a few variations exist in 1971 Topps Baseball and most are subtle differences due to the printing process. Missing copyright information, ink blotches and other non-glamorous issues constitute other reasons for the sets variations with several checklist cards. However, none of these cards carry any sort of additional premium. Collectors can find two inserts in the vintage release. Scratch-Offs return from the previous year with the same basic format. 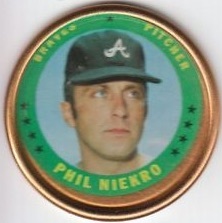 Also, as was the case in '64 Topps, 1971 Topps Baseball includes a large set of metal Coins inserts. 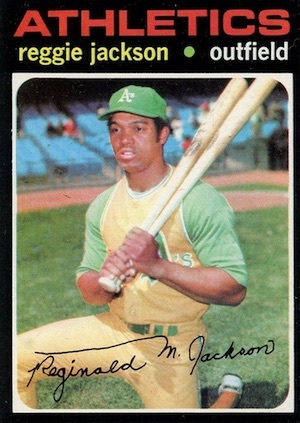 The advent of card grading forever changed the value of this set due to the condition issues. Collectors are urged to take immediate precaution with any raw cards. 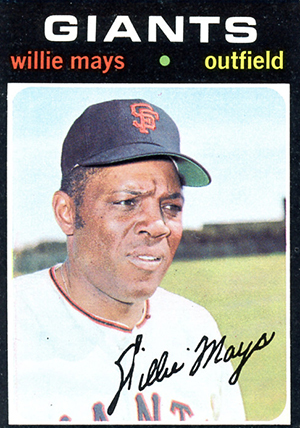 It should also be noted that due to the values associated with high-grade cards, doctoring or alterations are common for 1971 Topps Baseball. It's a good idea to have a ruler handy when examining cards from the set to insure that they have not been trimmed. Finally, the Canadian O-Pee-Chee version of 1971 Topps Baseball includes the entire set along with updates not found in the US release for traded players. OPC cards are easily distinguished based on the yellow backs and beacuse most feature French and English text. 1971 TOPPS # 597 KEN SUAREZ SGC 84 !! 752 cards. Shop for base sets on eBay. AS=All-Star. Short prints (SP) are noted below. 195 AL Playoffs Game 1 - Powell Muscles Twins! 196 AL Playoffs Game 2 - McNally Makes It Two Straight! 197 AL Playoffs Game 3 - Palmer Mows 'Em Down! 198 1970 AL Playoff Summary - Orioles Celebrate! 199 NL Playoffs Game 1 - Cline Pinch-Triple Decides It! 200 NL Playoffs Game 2 - Tolan Scores For Third Time! 201 NL Playoffs Game 3 - Cline Scores Winning Run! 202 1970 NL Playoff Summary - Reds Celebrate! 327 World Series Game 1 - Powell Homers To Opposite Field! 328 World Series Game 2 - Buford Goes 2-For-4! 329 World Series Game 3 - F. Robinson Shows Muscle! 330 World Series Game 4 - Reds Stay Alive! 331 World Series Game 5 - B. Robinson Commits Robbery! 332 1970 World Series Summary - Celebration! 24 cards. The cards are not numbered and listed in alphabetical order by last name. 1971 TOPPS #740 LUIS APARICIO PSA 8 ! Boston RED SOX ! ! Just too difficult to find cards in good collectable condition due to black borders. Least favorite set of the 70’s. Very handsome and frustrating set! Been trying to complete for 20 years now. It took me FOREVER to complete this set which I finally did about ten years ago. (I would not have been able to do it if it wasn’t for eBay.) I went to a garage sale about twenty years ago and saw a white card box that was marked “1971 Topps Baseball Not Complete” on the end. They were asking I think $25.00 for it. I wasn’t going to buy it at first but there had to have been at least 500-600 cards in the box and I knew that I’d be kicking myself later if I left it. I bought the box and sorted out the duplicates that I sold on eBay for $20.00. The quest to complete the set was on! 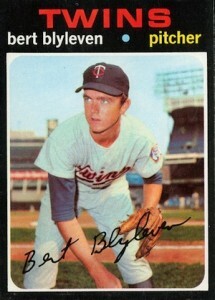 I started looking for lots of 1971 Topps Baseball cards. Depending on how many cards I needed in that particular lot was the lot that I went after. I’d pull the cards that I needed or upgraded an existing card and resold the lots. This went on for a while until I was down to the last few cards that I needed. I do remember buying the Baker/Baylor SP RC at a local card show for $80.00. I still have this compete set. Hard set to complete, when looking for nice cards. corner creases tend to turn white if handle too much. Also backs of cards can fade. This could be better set, but black borders & green backs show wear & tear over period of time. That’s my reason for 3 stars. I love this set because it is so tough to collect in high grade. I have 2 of them in EX/MT to NM/MT grade. One of the sets is nearly all NM to NM/MT. It’s a tough one all right but worth the effort. Flat beautiful black borders. I love this set, my favorite of all time. I was very fortunate to have completed the 1971 Topps set back in the 1980’s, when old cards were much cheaper then (and this was in the era before someone came up with the idea of graded cards, which meant that prices of cards in mint condition skyrocketed). Although it is important to preserve cards in pretty nice shape, I was never a fan of the so-called graded cards.